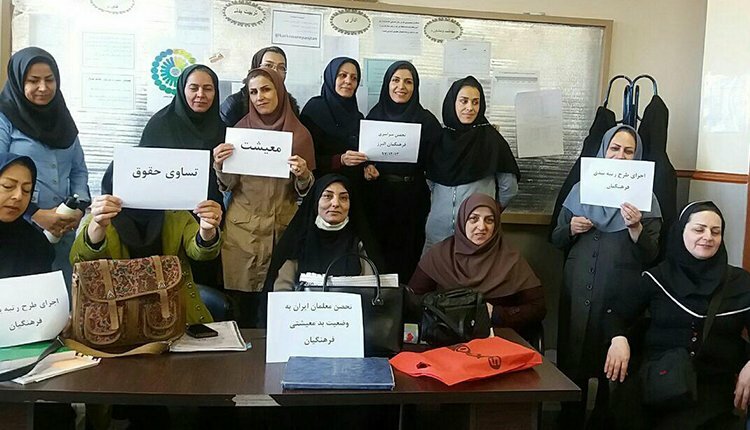 The second day of nationwide sit-ins and strikes by teachers and educators continued on Monday, March 4, 2019, in more than 44 different cities of Iran. Tabriz, Mashhad, Parand – Robat Karim, Kermanshah, Hamadan, Ray, Karaj, Saqqez, Marivan, Sanandaj, Shiraz, Kazerun, Kamyaran, Isfahan, Homayoon Shahr, Sarvabad, Paveh, Takestan, Zanjan, Qazvin, Khorramabad, Torbat Heydarieh, Tehran, Divandarreh, Zarand – Kerman, Tulem – Gilan, Mahabad, Bojnord, Mohammad Abad – Isfahan, Baneh, Sari , Savojbolagh, Azadshahr – Golestan, Amol, Nowdeshah – Paveh, Jolfa, Safashahr – Fars, Shahr-e Kord, Ilam, Islamshahr, Abadan, Qorveh, Shahriar – Tehran, Yazd. Iranian teachers and educators began their fifth round of nationwide strikes and sit-ins and will continue their protests until their demands are met. Iranian teachers and educators had held nationwide protests, strikes, and sit-ins on four previous occasions in the months of May, October, November, and February. Alongside the sit-ins and strikes of teachers, the defrauded clients of the Caspian Credit Institute in Tehran and the Padideh Shandiz in Mashhad launched protests gatherings on Monday, March 4, 2019. In Tehran, this protest rally was held in front of the clerical regime’s parliament. The defrauded depositors of Padideh Shandiz in Mashhad in front of the Khorasan Razavi governorate building.